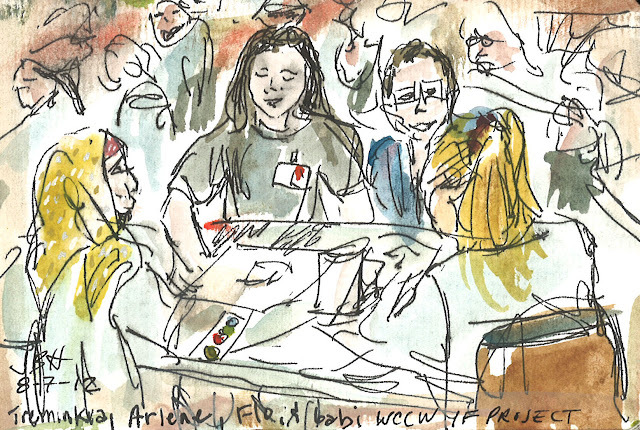 The Seattle Urban Sketch Workshop at the Washington Correctional Center for Women "IF" Project Monthly Session was a success. Thanks to Seattle Police Detective Kim Bogucki who runs the "IF" Project for inviting us! I didn't have much time to sketch myself but gave it a go while simultaneously taking photos and talking to the women so just a couple of very quick sketches. The room was bustling with all kinds of energy. 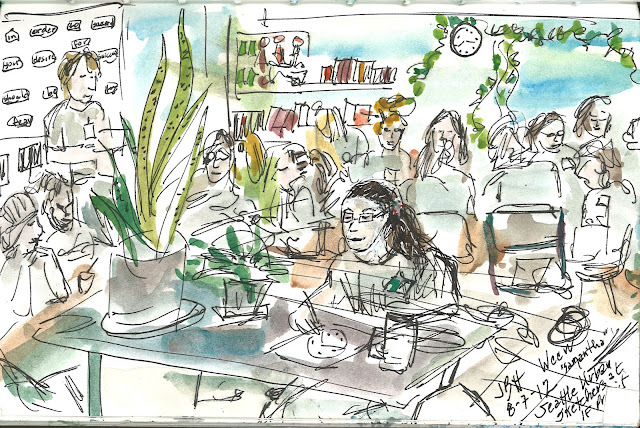 A young women named Samantha who was sitting alone intently sketching the computer and clock at the front of the room caught my eye. The other group I set out to sketch was a fun bunch - Treminka, Arlene, and Flo. They got a huge kick when Frank and Gabi drew them and Flo, who said she had never sketched before, did some incredible sketches of her friends. Her friends called her an "imposter" and she left saying she had found a new calling. Nice work ladies! Thanks for coordinating this sketchcrawl. It looks like you had a rewarding time and were able to share the love of sketching with the women. Look forward to seeing more sketches!